Click for a more detailed view. Stratum is supported by Silvon Software on Internet Explorer 11 and all currently supported servicing branches of Windows 10. Customers can expect to work with our excellent team of implementation specialists who will ensure that Stratum is installed and packaged to suit the needs of your business. Customers can find out more information about our technical support services by clicking here. 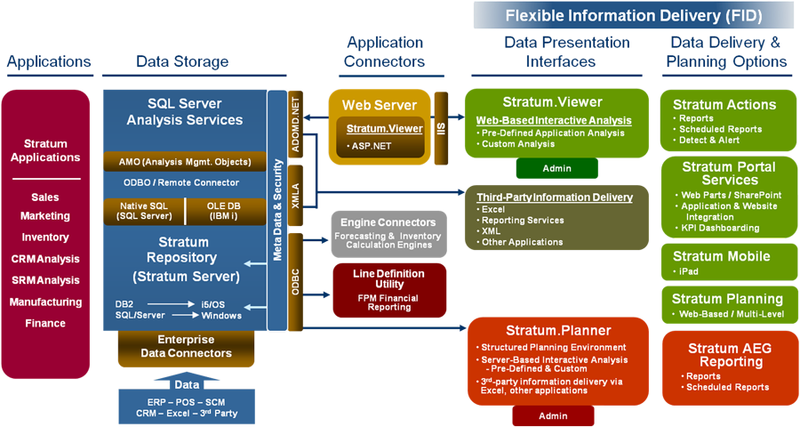 The foundation that supports Stratum (called Stratum Server) is designed and optimized for enterprise applications. Stratum Server connects to high performance transaction systems to generate a single repository of key data from all parts of the business (e.g., sales, inventory, purchasing, manufacturing, etc.). The data repository can reside on either a Microsoft SQL Server or DB2 on an IBM i. Multiple units of measure: Information can be presented to users in their own terms. Scalability: Large volumes of data stored at a detail level can be accessed at a high level and drilled to at the lowest level. Database change processing: Database changes can be addressed quickly and easily (e.g., sales rep reassignments, territory changes, changes resulting from M&A activity). List processing: Users can easily subset and save lists of products, customers, or any other information they wish to focus on for future analyses. Net-change updates: You can process net changes only for maximum performance. Performance tuning: Built-in performance monitoring facilities allow you to tune Stratum automatically while maximizing system resource utilization. Simple dimension and measure security. User-based menu and home page support. An application connector from the Stratum Server data repository to a Windows-based web server enables users to have access to relevant information - anytime, anywhere. A single- or multi-tiered web architecture is supported to allow for more efficient processing. Silvon’s open industry standard lets you connect directly to the Stratum database with solutions you already own while retaining the meta data and security that you’ve already established in Stratum. Any solution that works with Microsoft Analysis Services can access the data in Stratum. A structured, server-based planning environment is also available to legacy customers.